A computer software programming error may have doomed three new navigation satellites that crashed into the Pacific Ocean Sunday after their Russian rocket failed to reach the right orbit, according to a Russian news report. The Sunday (Dec. 5) Russian launch failure came after what initially appeared to be a smooth liftoff of three new Russian Glonass-M satellites atop their Proton rocket. But Russian space officials said the satellite trio never reached the proper orbit, and bad computer programming may be to blame, according to the newspaper Ria Novosti, which cited an unnamed space industry source. 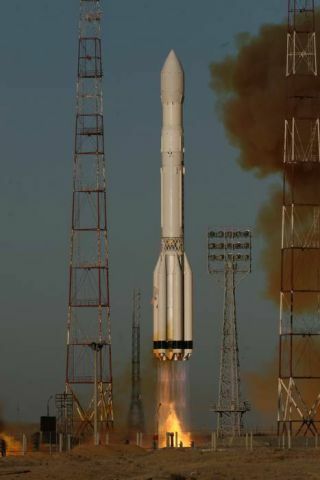 "According to preliminary information, there were no technical problems with the Proton itself during lift-off," Ria Novosti quote source as saying. "A range of specialists consider that program errors in Proton's onboard computer led to the engines failing to function as normal, giving the rocket an extra boost and taking it into the wrong orbit." Sunday's launch marked the third batch of Glonass-M satellites to blast off this year. But the satellites ultimately crashed into the Pacific Ocean about 932 miles (1,500 kilometers) northwest of Honolulu, Hawaii, Ria Novosti has reported. Glonass-M satellites are craft that perform a navigation service to civilian and military customers in Russia similar to U.S. global positioning system satellites. The satellites each weigh just over 3,000 pounds (1,415 kg) at liftoff. They are designed to last seven years in orbit, according to the satellite fleet manufacturer Information Satellite Systems Reshetnev Co. There are 26 Glonass satellites in orbit today, two of which are reserved as spares. The constellation is arranged n three groups of eight operational satellites at a time to provide global navigation coverage, Federal Space Agency officials have said. First Landing Photos: Secret X-37B Robot Space Plane Lands in U.S.